The Rebel Sweetheart. 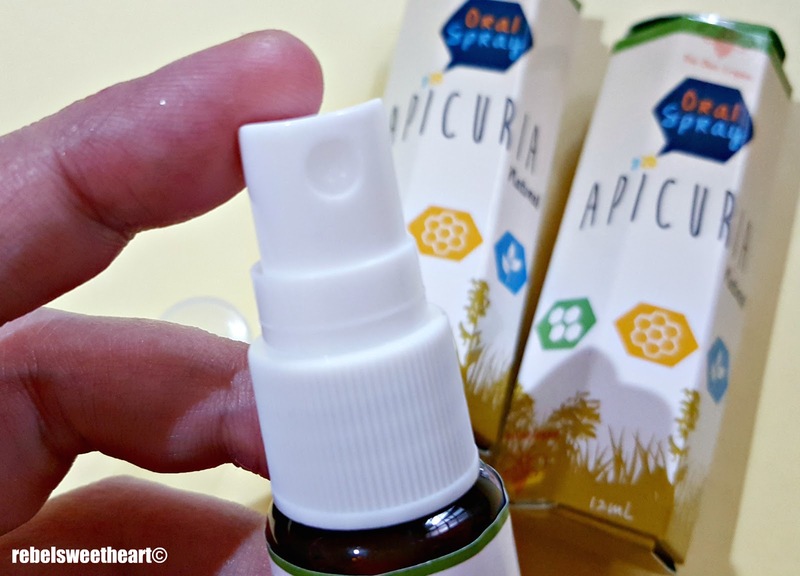 : Spotlight | Apicuria Natural Oral Spray. 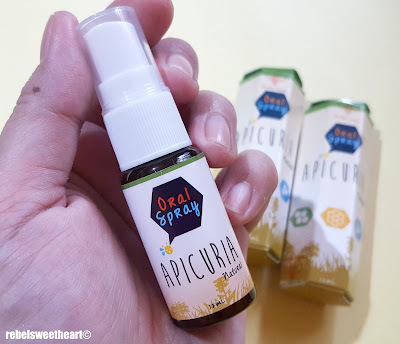 Spotlight | Apicuria Natural Oral Spray. It's officially the rainy season here in the Philippines, but for the past few days we've been experiencing nothing but the blazing sun and the scorching heat. Last weekend, however, was a totally different story. It rained non-stop, with thunder, lightning, and all. It's this extreme weather conditions that I'm always wary of, because it's times like these when Yue and I would often end up with a cough, sore throat, or a bad case of the sniffles. Thankfully, I came across this product - the Apicuria Natural Oral Spray - which can relieve such minor ailments. 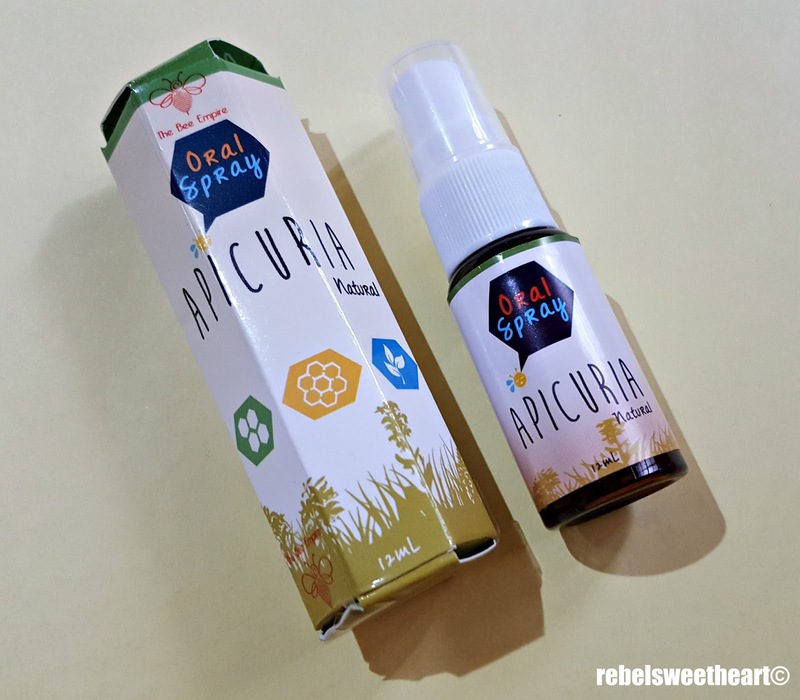 Dubbed as a'natural throat soother', this oral spray is made with honey, propolis, and a variety of herbs such as mint, calamansi, licorice root, marshamallow root, and perilla seed. Usage directions and expiry date. The use of honey as medicine is nothing new. It actually dates back to the ancient civilization, when the Egyptians would use it to treat wounds or even as an embalming fluid for their mummies. The antibacterial property of honey has been proven by modern medicine, thus making it one of the most potent and most natural antibiotic. 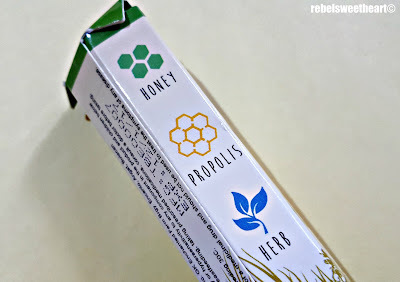 Made with honey + propolis + herbs. 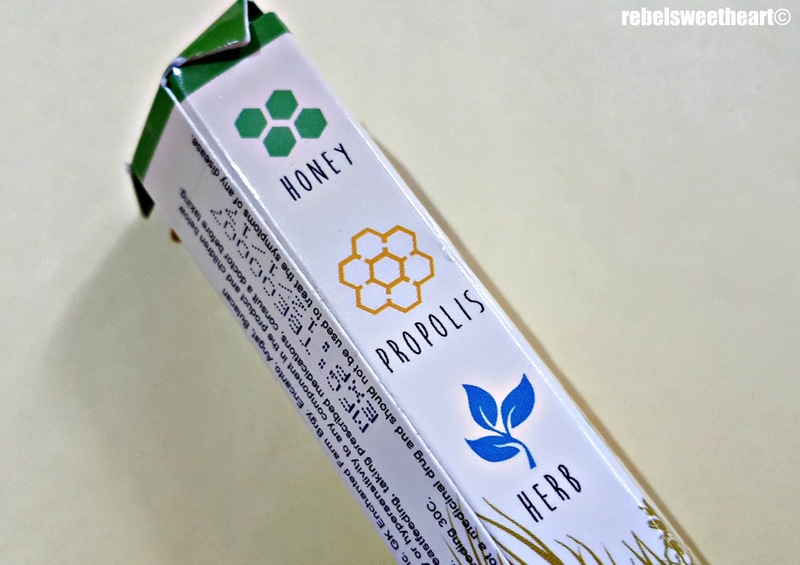 Similarly, the bee byproduct propolis has also been used for centuries to fight off infection caused by bacteria and to treat minor wounds. It also helps in boosting the immune system and hasten the healing of wounds. The Apicuria Natural Oral Spray is packaged in a hexagonal box, a reference to the shape of the honeycomb. The spray itself is housed in a 12 mL plastic bottle which comes with an easy-to-pump nozzle. Its handy and compact packaging makes it ideal for travelers and even frequent flyers. To use, simply spray 2 to 3 pumps on the throat, mouth, or affected areas (think canker sores, commonly known in Tagalog as 'singaw') 3 times a day or as needed, preferably after meals. The same text on the box are also printed on the bottle. I love the instant relief that I get from Apicuria whenever my throat feels scratchy, or when I feel like I'm about to catch a cold. It tastes sweet, just as honey should, with a hint of mint and citrus. But how I wish I had discovered this prior to our last trip to South Korea! You see, Yue got sick during our final week in Seoul. He had tonsilitis, which eventually led to three days of fever AND a trip to the doctor. Had I known about Apicuria earlier, we could have alleviated his sore throat then. The Apicuria Natural Oral Spray retails at Php 299 per bottle. Available at the Human Heart Nature online store, Human Heart Nature branches nationwide, and through the Apicuria official Facebook page. 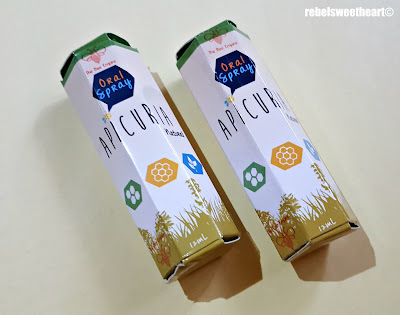 Labels: alternative medicine, Apicuria, apitherapy, bee propolis, green living, health, home and family, honey, Human Heart Nature, medicine, natural ingredients, organic, product review, The BeEmpire Inc.
Looks like a great, natural product. I try to use natural products as much as I can. This is my first time hearing about this product! I think it's awesome that it provides instant relief. This is the first I've heard of this brand and product, but I definitely want to give it a try. I always prefer to use natural products whenever possible. Plus, I've always found honey to be effective for sore throats. This sounds like a win-win! That's the right size bottle to bring to fly too, I think. It really would be good to bring on the plane. I love quick and easy remedies like this one. Plus it has natural ingredients that won't irritate the throat. Seoul Searching | Seoul Rose Festival. 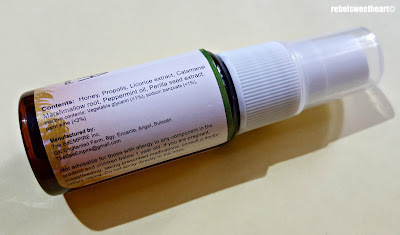 How to Use CBD Oil. Garantisadong Ginisarap Dishes by Marian Rivera! 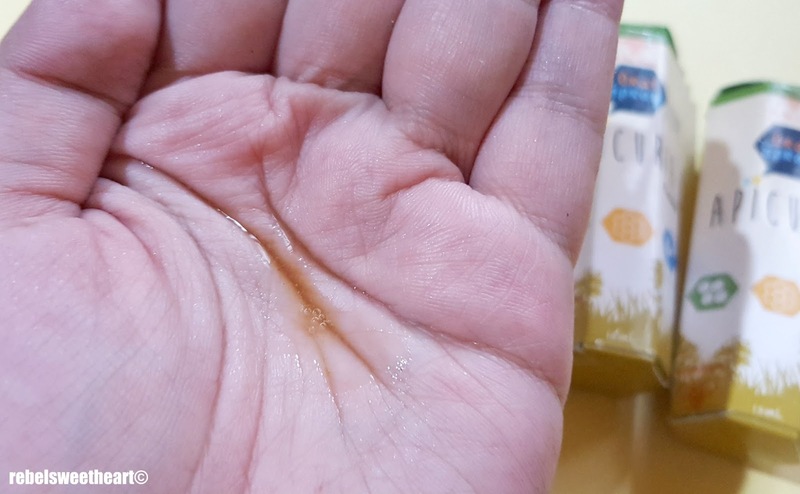 Spotlight | NLIHome Honey Soap. The 5-Day Flat Belly Diet Plan. Bespoke Gift Ideas for Father's Day. Spotlight | The Cellin Essence Cushion. Foodie Goodie | Shake Shack at Dongdaemun, Seoul.